Only 4 minutes walk from the town centre this family run traditional Scottish town house is ideally situated for restaurants, bars and the theatre. All rooms are en suite and provide more than a touch of luxury for those looking for a romantic break or perhaps a comfortable base from which to explore the beauty of the Scottish Highlands. There are no rooms available at Bluebell House for these dates. We loved our stay at Bluebell House and adored Neil and Margaret! The location was perfect, free parking in back, and the best breakfasts we had in Scotland! Thank you for your help and guidance, and for being our home away from home! The hosts were an absolute delight. They were very friendly and helpful with anything we needed. They have lots of local knowledge and were very willing to share it and give advise on where to go and what to look at. Thoroughly enjoyed our stay. Make sure to take the walk to the Ness Islands. We loved the B&B and Neil was great with recommendations and making it feel nice and at home. Would definitely recommend to others. Margaret and Neil were very helpful both before our stay and during it! I had a very sore throat while there and Neil noticed immediately and offered me honey whiskey which was served in the perfect cut crystal glass-and there are hairdryers hard wired into the bedrooms in front of a mirror! Wonderful. We really enjoyed Inverness and highly recommend Bluebell. We enjoyed Culloden battlefield, our son drove an hour to Royal Durnoch to play a memorable round of golf. Of course, it is near Loch Ness. The river is beautiful, all in all a lovely place to visit. We have stayed here on numerous occasions. Always a warm welcome awaits us. The Waterside (nearby) is excellent but busy - booking is advisable at busy times. Perfect accommodation! Great hosts! Can I recommend to everyone, it is wonderful. We had a lovely stay,it really is a first class accommodation with a very helpful host. Breakfast was a pleasure and yes we would definitely recommend it! Only a short drive to Fortrose and Rosemarkie which we enjoyed visiting. Also great for walking into Inverness of course. The Bluebell House was an absolutely lovely B&B! We ended up having to check outside of their normal hours and Neil and Margaret were kind and accommodating. When we arrived we found a welcome note and drink waiting for us since the could not be up to greet us themselves. Our group consisted of 2 couples and each of us found the rooms very comfortable and quiet. I think it was the best nights sleep I had on our 10 day trip! The on suite bathroom was clean and spacious. Neil served a delicious breakfast that I presume Margaret cooked. He gave us interesting insights and suggestions for exploring the Highlands. The food was amazing! Lots of variety too. I only wish we had more than one night to spend in this gem of a B&B. It was a perfect base for the Highlanda sights and I would absolutely stay here again. I’ve already recommended it to friends! Neil and Margaret were wonderful, helping with places to see and anything else we needed to make the visit as nice as possible. Breakfast was great, the shower had excellent pressure and the room was well appointed and had everything we needed. One of the best B&Bs we have stayed at. Thank you! We tried to stay away from the crowds so took 2 superb drives West and North exploring. The first was towards Ullapool stopping off for a lovely 2.2 mike hike along a river near Little Gave. (Ask Neil about it), and then going North from Ullapool. The second was to Applecross for a wonderful fish meal at the Applecross Inn. The drive there has superb views but is a a little hairy as a lot of it is on a single track road. Restaurants in Inverness worth visiting are the Mustard Seed and the Kitchen. Excellant service with very friendly staff. These were the finest inkeepers that we stayed with on our two week trip to Scotland. They were helpful,the food was wonderful and the place is spotless. A fabulous place to stay. Walking distance from train station. Close to everything!! Breakfast was great. We are vegans and they accommodated us easily!! Very friendly and helpful. Was fun to talk to at breakfast about the local sights and Scotland in general. Breakfasts were delicious, with Neil being very responsive as to exactly what we wanted. Centrally located. Within walking distance of many good restaurants, shops, laundramat, etc. Onsite parking. I love this little B and B having stayed there twice now. Hosts Neil and Margaret and so kind and generous with their time and it is clear that they enjoy what they do. Highly recommended. Thanks to Neil for being a fabulous host. He went out of his way to make sure we had everything we needed and is one of the nicest people I’ve ever met. The rooms were lovely and there were a lot of extra touches that made it seem like home, such as the DVD players and the wide variety of breakfast items available. Go Scotland day tours that depart from Inverness are great. The Extended Full Day Isle of Sky tour was our favorite experience. The scenery is awe inspiring and the guide Sandy was full of interesting and funny information about the Highlands in general and the Isle of Sky in particular. A charming B&B with kind of victorian interior, lovely decorated, perfectly clean and cosy. We had the four poster bedroom on the 1st floor for 4 nights. It is an older building, but the bathroom facilities are up to date. It is just a 5 minute walk away from the city centre and river Ness. The owners Neil and Margaret were very friendly and caring, gave us a bunch of great tips on what to see and where to go. Breakfast was traditional scottisch with a cereal buffet, and no extra wish was too much trouble. We felt very welcomed and comfortable and would return any time. The big room on the 1st floor is next to the entry and heading to the street. At night the street is not very busy, but those who have a light sleep may want to bring eartips. We had no trouble with that - we normally returned quite late after dinner and slept very tight after a day full of adventures in the highlands ;) Would choose this room anytime again, as it appears luxurious with its comfy four poster bed, just like in a castle. Truly wonderful stay and host. The made to order breakfast was delicious. Neil was very welcoming and helpful in every way. Thank you! Mustard Seed for dinner, WOW Scotland Isle of Skye tour. Great B&B. Neal is a fine host - very friendly and helpful. Rooms were very nice. Will definitely stay here nect time we are in Inverness. We highly recommend this B&B. Great location, very central for Inverness and surrounding points of interest. Our hosts could not have been more welcoming. Lovely room, and breakfast with a great selection. Try the Black Isle Bar for good organic wood fired pizzas and wine / beer. A trip out to see the beginning of the Caledonian Canal is well worth it. Neal was very friendly and accommodating making us feel very welcome. He was helpful recommending places to eat as well as places to see in Inverness. Rockpool is the best restaurant we ate at. Waterfront was great place to hear Scottish music in a friendly pub atmosphere. Very welcoming and friendly, and went out of way to accommodate our dinghy - excellent. Made some good recommendations for food and walks, all very good. Follow the guidance of Margaret and Neil. Walks down river really lovely. We got a warm welcome from Neil who secured our cycles then helped us find a good place to eat. The room was lovely, clean and well equipped. Breakfast was great too with a good choice of lovely food. All in all the perfect stay! Margaret's a great lady and wonderful cook! Neil served breakfast with a smile and great conversation. Accommodation was lovely and clean -- most appreciated was bathroom lighting for shaving and make-up! We just stayed the one night as we were joining a tour the next day. One of our best decisions - this is an outstanding b&b. 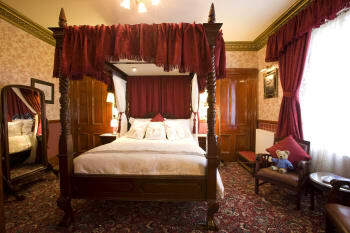 Comfortable and spacious bedrooms - enjoyed a 4 poster bed with a really comfortable mattress. Breakfast choice and quality was excellent. The owners are most welcoming and gave us lots of useful information. The very best of Scottish hospitality! Very close to shops and restaurants. Neil and Margaret are lovely people they couldn’t have been more helpful .The food was first class . Thank you. Another stress-free stay at Bluebell House. Reliable, friendly and comfortable with perfectly-prepared breakfast. Immaculate property, wonderful hosts and delicious breakfast! Faultless! The hosts were so helpful, friendly and warm. The breakfast was perfect to start the day. The accommodations were comfortable and clean. The location was perfect, near the city center for walking but quiet. We would recommend staying here without hesitation and hope to do so ourselves again! thank u very much for having us. you were an excellent host and the fresh made breakfast was delicious. we highly recommend this place. Lovely b&b great location and amazing breakfast! Thank you for a memorable stay. Wonderful location and easy walk to restaurants and shopping. Neil and Margaret are two very warm, sweet, welcomming people. Everything went just great. The room was adorable (even ready way before our check in time, so we had Access to it earlier than planned), everything was clean,the bed was super comfi, the breakfast was just awesome (also for veggies) but it is the people who made it so Special. Both are very interested in their guests and always up for a Chat, giving recommandations for tours and plans of the day. We will defnitely come back! Great location. Very clean and professionally run by Neil who can tell you where you can walk to see the restaurants near the river. Leave time on your holiday schedule to see Inverness - a very large but beautiful city. Unfortunately we were only in Inverness for one night, but wished we had allowed ourselves more time. Lots to do and see. Would be a good site for day trips out of the city. From an American perspective, gracious hosts Margaret and Neil have created the perfect Highland B&B; a romantic setting that harkens back to another time (yet includes all modern conveniences), walking distance to shopping and nightlife, delicious food, reasonable rates. Will certainly return! Living in the Pacific Northwest with access to fresh fish, seafood and an abundance of chef-owned/high-end eateries, we enjoy the on-trend take of traditional Scottish fare at The White House. Craft cocktails, great wine list, beautiful preparations. For a fun/tourist-friendly atomosphere, wide selection of whisky and live music, walk 1 minute over to Hootenanny. lovely stay! Bluebell House was wonderful! We enjoyed our stay! The bed and breakfast is centrally located with parking availability. Neil and Margaret were incredible, attentive hosts. The breakfast was excellent! Highly recommended to any travellers wanting to go to Inverness. Very friendly, super clean and great locations! Loved staying with you both and we look forward to seeing you again one day soon! Thank you! River House has THE best seafood, period! And for an amazing, backyard grilled burger? Try the Waterfront Tavern! What a great time all around! Clean, comfortable, and spacious. Neil puts on a great breakfast and I would recommend this B&B to everyone. One of the best bnbs we stayed at during our 14 day trip in Scotland. The cooked breakfast was very delicious. Excellent facilities and hospitality and handily located near the river and town centre. Stayed there on previous occasions and will do so again. Plenty of bar and restaurant options a few minutes walk away. I think small Bed and Breakfast establishments such as Bluebell House are proof that you don't have to stay right in the middle of town, amongst all the tourist activity or pay the big dollars that higher end hotels charge. Margaret and Neil were the perfect hosts, very warm and welcoming. The room and the breakfast provided were just right. I could not have wanted anything better. I did most of the attractions in Inverness, but also booked a day tour to Skye with Highland Experience which was great. I also caught the local bus out to Culloden, and found this service easy to access and reliable. I believe the bus station also has various tours that can be booked, and I know it is possible to book a private tour to various places for those without a vehicle. I loved Inverness to bits. Excellent accommodation. Margaret and Neil were very welcoming and friendly. Very comfortable stay. Off street parking was a bonus. Very close to city centre. Would stay there again. The location on the B and B is very good. Literally a five minute walk to the main part of the city. Great accommodations and breakfasts. Awesome hosts too. I would highly recommend Bluebell house B and B. Had the BEST time. So much so in fact that we were devastated we had to leave. Margaret and Neil are a lovely warm couple who made us feel more than welcome. One of the finest. Highly recommend The Fish House (a short walk from the Bluebell)and the Castle Restaurant (one for the locals) for a relaxed meal of sausages, eggs and baked beans served with a hot cup of tea. David and his wife were most gracious hosts. The room was comfortable, the breakfasts were outstanding and the location was central but with a quiet residential feel. We loved our stay. Do the river walk and eat dinner at the Waterfront. Good food and live music. Excellent service, very friendly staff, neat rooms. Friendly and helpful - always worked meals to suit us to allow for our travels. Would recommend using Highland Experience Tours. Drivers know their stuff. We enjoyed our stay at Bluebell House Very friendly welcome. The room was spotlessly clean and very comfortable. Lovely hot shower after a very wet day on our motorcycle. The breakfast was delicious, cooked to perfection. Bluebell house is very well situated for exploring the centre of Inverness. Within easy walking distance of different eating places alongside the river. Nice Hosts, all very clean. You can walk to the heart of the city in 5 mins. Best tips given by the host! :-) Gellion bar is nice and if you have car go to Dunrobin Castle. Graet. So close to Inverness. A perfect place to walk to restaurants and the city. The host was warm and helpful and our room clean and comfortable. The stay was short but very nice. Thanks! B&B located very close to Inverness downtown. Nice place and lovely owners. Very rich breakfast selection. Ask Margaret and Neil, they know best. We loved our stay at Bluebell House and hope to come back soon. Very comfortable, clean and nicely decorated B&B. Off street parking available. Easy walk to the town center. The breakfasts were great and the owners were very friendly and helpful in making sure that we enjoyed out visit. We highly recommended Bluebell House. We had a great stay at Bluebell House. Margaret and Neil were exceptional hosts, the room was very clean and spacious and the breakfasts were simply amazing. The location was excellent, just a few minutes walk from the centre of town, where there is a variety of bars and restaurants. Go for a stroll along the banks of the River Ness. Enjoyed my stay. Clean house and friendly service. Very good food. Walk along River Ness is beautiful. This is a fabulous B&B... best in Inverness! I strongly recommend this B&B. Not only is Mr. Hart is an incredibly gracious host, he is very helpful and knowledgeable about the sites in and around Inverness. The breakfast, which is made to order no less, is especially wonderful. 1. Culloden battlefield 2. Loch Ness boat cruise. 3. Mustard Seed restaurant 4. House of Fraser Kilt Makers... yes, I did purchase a kilt tailored to my measurements. The location is perfect, very near the city centre but in a quiet area. Very clean. Take the day trip to Orkney, long day travelling by coach/ferry but well worth it. We had a great stay at the Bluebell House. The hosts are extremely good and run a beautiful facility. We were in Scotland for ten days, spent most nights in a B&B and this was our favorite. The breakfast was excellent! Thanks for a great experience. We had a delightful stay. The advice from Neil about things to do was excellent. The accommodation was extremely comfortable. Breakfasts were absolutely excellent (the hosts know how to cook eggs! No small achievement!) We are hoping we have a chance to stop again in Inverness and will certainly try to stay here again. Great location for exploring inverness and surrounding area. Breakfast is great, the quality of food is very high and tastes fantastic. The hosts were very pleasant and helpful, but generally left you alone to enjoy yourself. 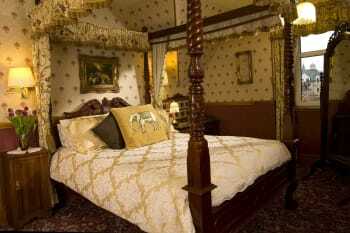 I would thoroughly recommend this B&B, treat yourself and get the rooms with 4 poster beds. Very friendly reception, clean and big rooms. Lovely breakfast. Breakfast was delicious. Our stay was excellent. Neil and Magarete were so nice and wonderfull. The breakfast was good and the room was a dream. it was near to the city too. We had a lovely stay and will come back. Thank you!! Go to the Gallions, it is quite nice. From Inverness you are in a great position to move around. We stay at Bluebell House for one night, the host Margaret was very friendly, advised us of places to visit and good places to eat (one of which we tried).We had a great time and will return to this lovely hotel. Thank you kindly for our lovely stay ! Everything was perfect and I will definetly come again on my next trip to Inverness! I will also recommmend you to friends ! Excellent service and lovely people ! The bluebell house is a warm and fantastic place to stay for a few or many days ! Makes you feel like home and the prices are amazing and the quality of stay is excellent! The rooms are beautiful and the staff very friendly and helpful ! The food all home cooked and delicious ! The location is also great - walking distance to the centre of Inverness. Ask for advice on where to eat, we got a list but unfortunately, could not get into any as it was Friday night and they were booked up. Just by chance we ended up at the White House on Union Street, however the food and service were very very good, and the staff nice and friendly so a lucky choice. Amazing room, very friendly host who made us a lovely breakfast each morning and had lost of great tips about restaurants and places for drinks. Location is a walk away from the center. Would definitely book here again for a stay in Inverness. My sister and I stayed at Blue Bell House in 2014 the first time. We just got back from a stay with them in May 2017. Neil and Margaret go above and beyond whatever you could possibly imagine! I've added another review for the last day we were there...it's just a warm, cozy atmosphere at the Blue Bell House! Don't miss a stay with Blue Bell House! Absolutely love Blue Bell House! Margaret and Neil are wonderful hosts and help with everything imaginable, from directions, to train schedules, to booking taxis, to just about anything! Don't pass up this wonderful B&B on Kenneth St.! Walking distance is a breeze to town, close proximity to everything in town but not right in town. The hosts are friendly, attentive and helpful. The breakfast room is pleasant and the food is very good. The furnishings are classic and comfortable. Stroll along the river, visit castles and lochs, and enjoy excellent food. The room was perfact, Neil and Margaret were lovely, the breakfast extra and the location perfect in the city center perfect. Everything was perfect. Very kind and helpful! We enjoyed our stay. The Bluebell House exceeded expectations in all regards. Very warm, personal welcome; exciting bedrooms with nice canopy beds; room enough to wall around the bed; superb breakfast; ideal location. Read the above comment. It was our launching pad for the next day trip to Wick, high up near Orkney Island...ample time to visit Glenmorangie and a castle en route. Easy friendly check in. Very warm welcome. Happy to provide useful advice. Very comfortable and spacious room. Our hosts were genuinely interested in making our stay memorable. Thanks. Enjoyable and friendly. Also a fine breakfast. 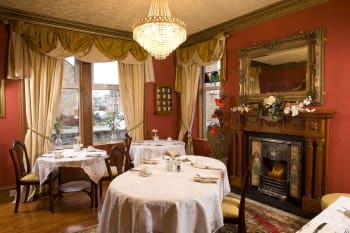 We stayed at Bluebell on are way to Edinburgh and Neil made us feel right at home.After helping us with our bags he gave us some great recommendations for dinner. The rooms are very clean and spacious. Breakfast the next morning was amazing, we tried the traditional Scottish breakfast and it was more than we could eat. We would definitely stay again. Thank you for making our first night in Scotland memorable. The owners were really helpful and nice, the breakfast was lovely and adapted to our taste and diet requirement. The bedroom was great, well decorated and really confortable! The location was perfect (5 min walk from the restaurants). Thank you so much for making our stay in Inverness such a great experience. This was a return visit for us to Bluebell House. We stayed with Margaret and Neil 18 months ago and on our return visit to Inverness there was no question of where we wanted to stay. Our room was cosy and comfortable and the bathroom too. Many a hotel/bnb could take a tip from you on this! Lovely breakfast - we had no special wishes, but got the feeling nothing was too much trouble. A fine full Scottish breakfast was served which was delicious. We can thoroughly recommend Bluebell House. Thankyou both once again! We had a wonderful time at the Bluebell House. Our hosts were very friendly and did everything to make our stay with them perfect. The breakfast is fantastic and the rooms are extremely clean and lovingly furnished. We loved our 4 poster bed and the kindness of the owners. Our first B&B experience and it will be impossible to top. I can't think of a single thing that would have made our stay better. My tip for other travelers would be to stop searching for a place to stay - you found it! Bluebell House will not disappoint. It was wonderful staying at your BB. Ilse of Skye! That's a must do! The Bluebell house is conveniently located within walking distance of the city center. Our hosts were welcoming and helpful with recommendations of things to do. We had the first floor 4 poster room, which was lovely. Our breakfast was excellent. Private parking was available, which was a big benefit in this neighborhood. I highly recommend this B&B. Enjoy a short walk across the river to the shopping district, and one of the many fine restaurants and pubs nearby the B&B. Gorgeous B and B. And we needed to check in early and the owners were so nice to accept. Would go back for sure!!! Book this one. My only tip!! Beautiful home. Excellent friendly service. Great location. Parking is a bonus. Margaret and Neil are the perfect hosts. Charming, welcoming, extremely friendly and very knowledgeable about the area. Nothing is too much trouble and they go out of their way to ensure your stay is as pleasant and stress-free as possible. The breakfasts are superb with a varied choice cooked to perfection. No complaints whatsoever. First class! Margaret and Neil are wonderful and always available for any questions, dinner reservations or suggestions that one may have during their stay in Inverness. The breakfasts are wonderful and the accommodations clean and very comfortable. I will continue to stay at the Bluebell House every time I come to Inverness. Loved our hosts, Neil and Margaret. They were extremely helpful in orienting us and booking taxis and reservations at top notch restaurants. Walking distance to all the downtown stores and restaurants and entertainment. Very safe neighborhood. There is private parking but we didn't need it as we didn't rent a car. Just ask Neil for recommendations. An absolutely great B&B! The hosts were lovely, very hospitable, breakfast was delicious - love the scrambled eggs and the room was clean, cosy and big. Our favourite place to stay during our trip. Great location, only 5-10 minutes walk to Inverness city centre. We've really enjoyed our time there. We had a wonderful stay at Bluebell House. Margaret is a great person, she is always happy to help you and talk to you. She cooks delicious breakfast: we asked for the Scottish one and it was superb! The room was clean, comfortable and spacious, a perfect base for discovering the highlands. We strongly recommend her bb. The accommodations were extremely clean and comfortable. The breakfast was FABULOUS!! Our hosts were very welcoming and gave us wonderful advice on places to see as well as eat. All in all a great experience! As before we had a wonderful time and felt like family with Neil and Margaret. We feel truly at home! Margaret and Hugh are the ultimate hosts. Everithing, and I mean, EVERITHING was perfect!!!!! I've loved staying at the Bluebell House and I will stay there if ever come back to Inverness. Thanks to Neil and Margareth for their lovely B&B. It was absolutely delightful! The location was outstanding, nice short walk to city center and visitor information center. The room was beautiful! It was also quiet, clean and well supplied! Neil and Margaret were the best of hosts! We can't wait to see them again! Short walk to River Ness, city center to catch tour bus, etc. Souvenir shop on corner is open 7 days a week until 10pm. Tesco Express (small grocery store) has everything and is located within 5 minutes of Bluebell House. Johnny Fox (Pub) had a delicious Seafood Broth. City bus is cheap, convenient way to get to the Culloden Battlefield. Bluebell House was such a lovely experience. Neil was warm and welcoming. He made us feel very comfortable during our stay. Margaret was so kind as well. We slept great and enjoyed the DVD selection that was offered. Neil gave us some wonderful recommendations for food that we thouroughly enjoyed. It was exactly what we were looking for. The Mustard Seed was recommended to us by Neil and others around town as a great place to have dinner. Unfortunately, it was so busy when we arrived and they only had room for their reservations. I would have liked to try it. So future travelers, make reservations ahead of time and enjoy on our behalf! The Bluebell House was my favorite of all the B&B's I stayed at in Scotland. I cannot recommend highly enough the excellent service we received here. 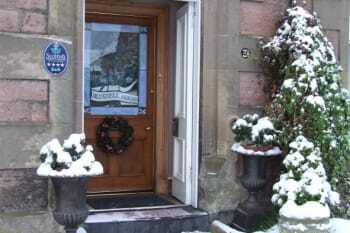 The Bluebell House should always be your first choice of where to stay while in Inverness. Mary and Neal really make you feel like family. The Ness Walk along the river is very picturesque and charming. I highly recommend it. Comfortable room with good beds, quiet at night, good shower, lovely breakfast and very good and helpful hosts. Five minutes walk to town centre. We loved our stay at Bluebell House. Our hostess, Margaret, was charming. She recommended some great local sites for us to visit and places to eat. She provided maps and pamphlets of attractions. Breakfast was delicious. The room was lovely, with a very comfortable bed. This was the nicest place we have ever stayed and we would definitely come again and have already recommended it to others. Go to RocPool restaurant - service and food excellent. Do not go to Mustard Seed - we had dreadful food and service compared to RocPool. It would be hard to believe that it was a one-off night. We did hear subsequently that the chef has left so that may be the problem. We much enjoyed staying with Margaret and Neil at the Bluebell House. They were very friendly and hospitable, although that seems to be a common characteristic of people in Scotland. They readily offered advice and assistance with restaurants and sightseeing. The home-cooked breakfasts were very good and offered a wide variety of choices. Our room was beautifully furnished, but the stall shower was a bit cramped. We dined at three restaurants in Inverness, all within easy walking distance of the inn. All three (Riverside Restaurant, Mustard Seed and River House)are recommended. From Inverness, excursions to Loch Ness and Urquhart Castle and to the historic Culloden Battlefield are easily arranged and highly recommended. We also took a train journey through the Highlands from Inverness to Kyle of Lochalsh, which was very scenic. Not a bad word to say. We felt welcomed right away and the breakfirst was delivious! Thank you! Nice room in a beautiful house close to the center of Inverness. Everything was perfect. We got some very helpfull tips from Neil. Very friendly. Very nice and clean room. Good tips for visiting the city. If you are looking for a nice pub for having dinner, try The Waterfront. Hosts Neil and Margaret were very helpful and responsive to our all our requests and questions during our 3 day stay. We were especially appreciative of their willingness to receive and hold our concert tickets until our arrival. Each morning we were treated to a marvelous breakfast, including a nice local tradition with our porridge. On Sunday, Neil suggested the "quiet drive" to Fort Augustus, which greatly added to the scenic and rural experience we were seeking. Bluebell is very centrally located and walkable to many restaurants and a grocery store only a block away. Parking is provided in Bluebell's private car park. Lovely warm welcome. Very helpful local info. Mustard Seed restaurant highly recommended. Very welcoming and friendly. Good location for the town, few minutes walk. Good breakfast, would prepare anything you wanted for breakfast. Private car park a big advantage. Many restaurants close to hand. Close proximity to the town and river. Good base to explore the area from. Margaret is wonderful! She was helpful, accommodating, sweet and funny. I was so glad we found her and her bed and breakfast. It was a great way to start our "holiday"!! This is a lovely, clean, very welcoming guest house. The room was spotless. You can tell the couple that run Bluebell House take great pride in what they do. Breakfast was wonderful and I would highley recommend the scrambled eggs with Salmon. We enjoyed every bit of this fine b&b and would return if the chance arises. Thoroughly enjoyed our stay at Bluebell House. Very easy to find, off street parking, perfect location, and even better hosts. The bed was amazing (four poster US queen (UK king) with lovely soft sheets. For frequent travelers like us, you learn to appreciate a great bed! The breakfast was also excellent and we really enjoyed chatting with our hosts. Highly recommend to anyone. Our hosts recommended Rocpool Restaurant for it's seafood. Had to book an early seating to get in but it was well worth it. Excellent seafood and friendly, knowledgeable staff. Also enjoyed sitting at Foxes pub and chatting with the locals. Beautiful house, like a home from home. Room was gorgeous, bed so comfy we slept in for breakfast. Friendly hosts we really enjoyed our stay. Just ask the owners for advice. Wonderful, comfortable room. Wonderful people run this bed and breakfast. I would highly recommend staying here! We loved our stay at the Bluebell House. We had been traveling quite a bit and the beauty and comfort of the house and our awesome room with 4 poster bed helped restore us. Margaret is a fabulous host. She gave us great recommendations and took care of every need. The place is immaculate and the breakfast was excellent. Fabulous B&B! Our favorite restaurant was Riverside Cafe, across the footbridge on the other side of the River Ness (10 Bank Street). Some things we enjoyed: walking along the riverbank, seeing the Inverness Cathedral, touring the art museum. Outside Inverness the Clava Cairns were amazing. We also enjoyed the Cawder Castle. It's been a wonderful stay - the owners are superfriendly and helpful and breakfast is superb. It's been our second time there. It's just a five minute walk from Bluebell to the city center. Stay as long as you can! Margarette and Neil treated us like family from the moment they met us at the door. Clean, well kept, large room with comfortable couch and bed. Great location and breakfast. Highly recommend this home! Johnnie fox. Great pub food and atmosphere. Thank you. We're both so glad that you had a good time. Wonderul place to start holiday, cosy and so clean and comfortable, amazing bed and breakfast delicious.really kind hosts too. Wonderful hospitality and a beautiful home! Great location, easy to find, easy walking to town center. Highly recommended. Two of the best restaurants outside of Edinburgh. Both 2-3 blocks away and on the river. Both equally good, Rocpool and River House. Margaret was very helpful with regard to offering advice on places to visit and was able to recommend restaurants. 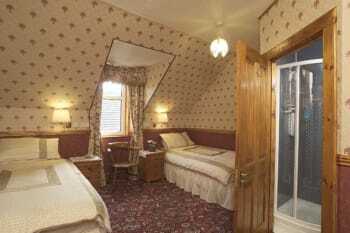 We had the ground floor Bluebell Room with four poster bed and en-suite shower room which was lovely and very clean. The breakfast choice was good - fresh fruit, yogurt, cereal, granola, fruit juice, full Scottish breakfast, toast and tea/coffee. The Loch Ness visitor exhibition is worth a visit as is Fort Augustus with the six locks on the Caledonian Canal. We ate at the Mustard Seed Restaurant and the Riverside Hotel Restaurant, both of which were very good. Fantastic B&B, fantastic hosts, fantastic breakfast! Would recommend to anyone staying in Inverness who is looking for a central and unique experience. Neil and Margaret were charming and hospitable. We stayed two nights and we feel at home. The room is lovely and clear; the beds are very confortables. The staff are adorable and the service excellent. The breakfast is delicious in a beautiful room. Beautiful room, very comfortable. Our host was friendly, helpful and well informed about the area. The good restaurants are very busy so think about making reservations. We had a great stay at Bluebell House! Neil is an excellent host. The breakfasts were always so delicious and our room was comfortable and relaxing. I would highly recommend Bluebell House to anyone! Beautiful room and Neil was a perfect host. Breakfast was excellent. Accueil très chaleureux et agréable, parking à disposition, facile d'accès et situation parfaite (5 min à pied du centre ville), très propre et confortable, excellent petit déjeuner, en fait tout était parfait pour nous. Your hospitality was terrific--we felt as though we were visiting friends in the Highlands. I wish we had planned our trip to stay longer. Such a warm welcome and friendly, helpful owners. Excellent standard of cleanliness and great range of choice at breakfast. We thoroughly enjoyed our stay. Un accueil très chaleureux et attentionné. Que de bons conseils et une grande gentillesse. Propreté, bonne literie, bon petit déjeuner, caractère et bon emplacement. Pour résumer : très bien. Suivez les excellents conseils de votre hôtesse pour les restaurants et les sorties. Inverness constitue une très bonne base pour des balades vers le Loch Ness, Glen Affric (randonnée à faire absolument : c'est magnifique), Cromarty, Fortrose, Nairm (plage magnifique)... et offre aussi une agréable promenade le long de la rivière Ness. Neil and Margaret were very friendly and made us feel comfortable from the moment we arrived. We especially appreciated the parking in the back. The morning we left, Neil went to the trouble to leave us directions to get us easily to our next destination. We will definitely stay at Blue Bell next time we're in Inverness. Had a really nice time staying at the B&B, the owners are extremely friendly and really accommodating! The rooms were really clean and the beds I have to say we're SO comfy, would highly recommend for somewhere to stay. The breakfast were really good aswell and would also ajust to what you wanted! Overall I would say 5 star for this place. 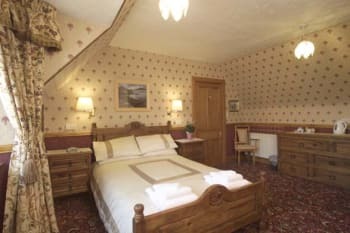 The B&B is really well situated, it is only a 2min walk to the town centre where there is lots of pubs and restaurants! The only tip I would give is, if you like nice places to eat I would recommend you book in advance as we could not get in anywhere!! 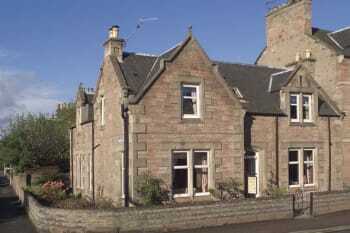 We highly recommend staying at Bluebell Guest House and any time we stay in Inverness we always go there. It is in a good location with a car park for guests which is great as many have no dedicated parking. Both Neil and Margaret are very welcoming and nothing is to much trouble. The breakfasts are excellent with a wide variety to choose from. The rooms are lovely, spotless and decorated to a high standard. You can't ask any more from a guest house than what is on offer. It beats many hotels we have stayed in so it is an easy choice when we are in Inverness of where to stay! Just Brilliant! A fantastic stay. Superb hospitality from the hosts, a great breakfast and a really comfortable room. We loved Neil! He had great advice on places to see and restaurants to eat at. Very welcoming and made accommodations for our late arrival! If we come back to Scotland we are definitely staying at Bluebell! Isle of Skye was amazing! Make sure to take the southern route from Inverness and try and spend more than one day. We only went for one day and we could have done a lot more adventuring. Lochness was gorgeous! We took the less traveled route and it was beautiful with scenic views and places to park along the way. Very friendly and helpful.Great room, comfortable bed, facilities spotless. Plenty options for breakfast, a great place to stay, we will go back if up in inverness again. Great house! Great hosts! Great breakfast! Four poster bedroom was so divine I hated getting up! Delightful place to stay with FABULOUS breakfasts. Wonderful, welcoming hosts - could not have enjoyed it more. Five minutes easy walk to anywhere. Thank you! Restaurants within 7 minutes walk are outstanding - hosts will recommend and make bookings. Trust them! A day trip to Castle Dunrobin is a must (local busses will get you there, passing through beautiful scenery) - the falconry show is a must-see. Brilliant. We loved the Bluebell House! Neil was terrific and made us feel very welcome and right at home. We had a room with a four-poster bed, which was comfortable and roomy. Our bathroom wasn't very large, but very suitable and the shower was wonderful. I needed a softer pillow, which was provided to me immediately upon my request. The breakfast was delicious and made to order. Having parking onsite was wonderful. I would definitely stay here again! Although we had a rental car, Bluebell House was within walking distance of the main part of the city, so we never needed to use the car. Had a beer and tea at the Castle Pub - traditional Scottish place - very nice. We ate dinner at The Mustard Seed - very good. There is a great walk up the River Ness, which was lovely. We also spent some time at The Highland Archive Center - well worth it if you're doing some family history searching. The people are incredibly nice and helpful. Comfortable and charming. Thank you Neil and Margaret. Urquhart's for fish pie and ice cream. Yum. Bluebell House is an excellent place to stay in Inverness. The room was lovely and Margaret the host was very friendly and made us very welcome. There was a delicious breakfast. We would highly recommend staying there. Bluebell is a little oasis of luxury in a busy city. Bluebell has its own car park around the back, which is helpful as the front door is on a busy street with no stopping. Bluebell is about 10 mins walk from the city centre, a pleasant walk over the footbridge over the Ness. Thanks for all your assistance especially when I overbooked! Wear layers and bring an umbrella. Perfect location. Fabulous breakfast. Roomy, cozy. Very fun and easy hosts. Jacobite 3 hour Loch Ness cruise leaves from Tourmnahurich Bridge was delightful; walk the Bank St path over the river islnds to get there. The rooms at Bluebell are very nice and there's off- street parking in the rear. Margaret is one of the most charming hosts we've ever had! Great place to stay and would stay again without hesitation. Bed was very comfy and had some great nights sleep there. Dinner at the Mustard Seed is excellent - book a table or you probably won't get in and that goes for any night of the week. The pre theatre dinner is splendid. Dinner at the Waterfront it also very nice only a couple of minutes walk away. The city centre offers a wide range of interesting shops and a walk along River Ness is really worthwhile in the evening when the lights go on. The Buebell House is perfectly situated for trips to Loch Ness as well as to Cromarty, Rosemarkie and the city centre is just across the bridge. We recommend the restaurant `the Waterfront`, which is situated just a 5 minutes walk away at the River Ness. They have lovely dishes for a good price. My girlfriend and I had a really lovely stay here in the Bluebell Room. 4-Poster bed was incredible (room for me without the girlfriend on my half). The hosts couldn't have been more hospitable and made delicious breakfasts each morning for us, and gave useful recommendations of places to visit. The location was in a nicely quiet area, just 2 minutes from the river and just 5 from the main town. Would definitely stay again. Get the 4-Poster. It's really great. A wonderful and homey B&B. It was very clean and well appointed with a very friendly couple that ran it. The bed was comfortable and the breakfast was delicious. I would love to stay here again! Very friendly welcome and we were made to feel at home as soon as we entered the front door. Clean comfortable rooms with everything you need at hand. Excellent breakfast too. If you want to eat out in town, it appears you need to make a reservation asap. we tried several premises that evening, but nothing available until after 9pm earliest. We very much appreciated the friendly and useful tips about places to eat and what to expect. The two restaurants facing River Ness have very good, tasty, and surprisingly low-priced "early evening dinner" menus. Lovely house, very comfortable bed and nice big room. Service was excellent and a really nice breakfast with a choice of cereal, fresh fruit and juice and also a cooked breakfast. The owners were very nice, friendly and helpful. I would definitely stay there on my next visit to Inverness. Thank you for a lovely weekend. The Bluebell is centrally located with easy access to the shopping and restaurant areas. Lots of choice for restaurants. One of the best B&Bs in Inverness. Highly recommend. It was a fantastic stay! Excellent guesthouse, full of character, wonderful and attentive hosts. Breakfast was lovely. Lovely place, hosts are so kind and very helpfull, breakfast was high class. Margaret let us even leave the car on their private parking the next day so we can do some christmas shopping. Thank you! 2nd stay and I was delighted to be back. My room was comfortable and I had my best nights sleep in ages. The breakfast is fantastic as always- I love sitting at the window with the morning sun coming in! Proprietors are warm and friendly and really make you feel welcome. When travelling to Inverness on business I'll definitely continue to stay here. Perfect place to stay while in Inverness and excellent base for visiting the local tourist spots. Bluebell House was quiet, clean, very comfortable and offered excellent breakfasts and friendly hospitality. I will be recommending it to any friends or family who wish to visit the area! We could not have asked for more and enjoyed staying with Neil and Margaret. We thoroughly enjoyed our stay in Inverness and Bluebell House. Our Hosts were both friendly yet professional. The room was large and very clean. The River House restaurant was fantastic and an easy walk. Lovely welcome from the owners and our room was wonderful. We had a really relaxing stay. The room was big and nicely furnished and decorated, and felt really homely. Our breakfasts were really top notch. We loved our time at Bluebell House! Really enjoyed walking across the river into the more fun part of the city. Great location. Hosts are very thorough and friendly. Lovely breakfast with nicer variety than most places. Very kind folks....we left an item in our room, and our host tracked us down at mass to return it! Much appreciated!! Very nice B&B with with a delightful welcoming. Lovely bedroom (the opportunity to borrow DvDs is appreciable). Perfect breakfast (especially the fresh fruits). John Foxes Pub Ness Islands walk. Loved our stay at bluebell house! We both felt very welcome! Margaret and Neil, the best hosts I have ever met! The rooms were very spacious, clean, welcoming and the bed was very comfortable! The breakfast was sensational! Wish we could've stayed longer! Very good recommendations made by Neil from bluebell house! We had a wonderful meal at the mustard seed, definitely worth a visit and worth booking up! Very good location in the center of Inverness, with a private parking behind the house. Super easy to find, and near the main touristic routes out of the town. Warma nd friendly welcome, a lot of advices for wher to eat, to listen music, things to see... It was a real pleasure ! And perfect breakfast ! We had a truly fantastic stay at Bluebell House, Neil and Margaret were so welcoming and kind, the room was beautiful, the breakfast was fantastic and options plenty. You made a really special trip for us all the more special and we would not hesitate in staying again or recommending you. Thank you so very much. Thank you so much for your lovely review. We're delighted that you enjoyed your stay. Spacious, well appointed and comfortable room, 5 minutes walk from the centre of Inverness. Friendly and helpful hosts. We thoroughly enjoyed our stay, and the room was lovely. The booking for dinner was perfect, and there was plenty to do within easy walking distance. In every way, an excellent experience. Although the address shows the location to be on Kenneth Street, the street name is not easy to see. Travelers should be aware than Kenneth Street is also A82. The Bluebell House faces A82 and there is a great car park in back. Very nice b&b nearby short walking distance from Inverness. Friendly hosts. Room was very cosy, good bed, good bathroom. Strongly recommended. Local restaurant: the mustard seed. Beautiful en-suite four poster room. I would definitely go back. Excellent place to spend the night, very impressed. The Kitchen is a great resturant, just around the corner. Good price and excellent quality.